Authentication stickers are one of the best things in the hobby because it gives you SOME comfort knowing that the autograph has been inspected. Usually I don’t mind where a company places the sticker on a baseball, football, basketball, or hockey puck. But when I saw this autographed buyback from 2009 Upper Deck Goudey, I had to shake my head for a moment. Its good that Upper Deck used PSA/DNA to authenticate the autograph, but why do they need to place a sticker directly on the card? I wonder what would happen if someone wanted to send these in for grading? Would that sticker hurt the card’s grade, or would they leave it alone since it came from a 2009 product? Usually PSA/DNA authenticated cards come in a slabbed holder. But I guess this was the only choice for 2009 UD Goudey. The Goudey Gum Company produced some of the best, and most valuable cards that the world has seen. 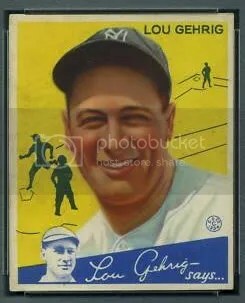 Back in the 1930’s the Goudey Gum Company was mostly known for their gum and not their sports cards that were included in each pack of gum. During the early 30’s, America was in a depression and companies were losing a lot of money. The Goudey Gum Company had a great idea on how to make some more money and stay in business. They created a set of cards for their packs of gum. This set included 240 cards of some of baseball’s best players. 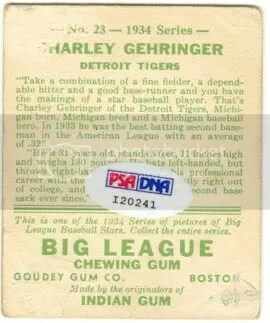 In my opinion, the Goudey Gum Company was the first sneaky card manufacturer. This is because in 1933 they purposely left out card number 106 in the set. They did this so more and more people would buy their packs of gum. Since more people bought the gum, trying to find card number 106 to complete their set, Goudey made more money. About a year later, they came out and said they left out card number 106 on purpose. 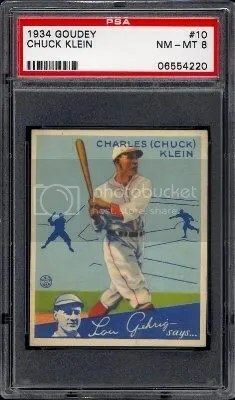 In 1934 Goudey made card number 106 so people could complete their set. 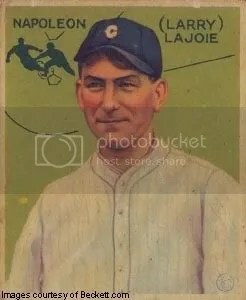 Card number 106 was of Nap Lajoie who played many years before this set was even made. This is a great example of how American history can be connected with the card industry.